This unprecedented exhibition marks the first public presentation of the preeminent psychologist C. G. Jung’s (1875-1961) famous Red Book. During the period in which he worked on this book Jung developed his principal theories of archetypes, collective unconscious, and the process of individuation. It is possibly the most influential unpublished work in the history of psychology. More than two-thirds of the large, red, leather-bound manuscript’s pages are filled with Jung’s brightly hued and striking graphic forms paired with his thoughts written in a beautiful, illuminated style. 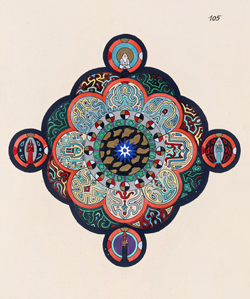 Jung was fascinated by the mandala—an artistic representation of the inner and outer cosmos used in Tibetan Buddhism to help practitioners reach enlightenment—and used mandala structures in a number of his own works. Jung’s first known mandala-like work, Systema mundi totius (1916), will be on display. Created between 1914 and 1930, the Red Book has never before been seen in public, outside the circle of Jung’s family and very close friends. Alongside the 95-year-old volume will be a number of oil, chalk, and tempera paintings and preparatory sketches related to it and other original manuscripts, including the Black Books, which contain ideas and fantasies leading up to the Red Book. The exhibition coincides with W.W. Norton & Company’s publication of a facsimile and translation of the Red Book.